Oil now flows through the Dakota Access Pipeline and it may never stop, but the point man in the ongoing and politically fraught legal battle to prevent it, Jan Hasselman ’97, bore witness as the Standing Rock Sioux reservation became a worldwide symbol of defiance and revived the notion that power still resides with the people. Black smoke billowed from the charred remains of teepees as troopers advanced on the Oceti Sakowin camp at the northern edge of the Sioux reservation. What remained of the settlement’s indigenous population, the self-proclaimed “water protectors,” scattered to the south through shin-deep mud and across the still-frozen Cannonball River to the refuge of the Rosebud/Chichangu camp. But the soldiers pushed on, capturing all of the stragglers except a few who reached Sacred Stone, a sanctuary beyond federal lands. This trail of tears didn’t coincide with the Indian Removal Act carried out by President Andrew Jackson during the 1830s. Nor did it play out the day “Indian country” vanished forever when Oklahoma became a state in 1907. The displacement of people by National Guardsmen near the Standing Rock Sioux Tribe reservation happened in February 2017, and the world was watching. Accordingly, there’s a hope that what took place there—and why—won’t become another milepost in the global disenfranchisement of indigenous peoples, like the Standing Rock Sioux. At least that’s what their lawyer, Jan Hasselman ’97, thinks. Native Americans’ collective suffering at the hands of the US government is now into its fourth century, and well documented. As it relates to the tribe at Standing Rock, the transgression is roughly a mile-long stretch of an oil pipeline thirty inches in diameter that spans a third of the country as it pumps crude from the shale flats of northwestern North Dakota to a terminal in Patoka, Illinois. If you ask Hasselman, the helmsman of Standing Rock Sioux Tribe v. US Army Corps of Engineers and Dakota Access, LLC, he contends that despite history’s wretched chronicle, the events at Standing Rock and the continuing legal clash over the now-completed pipeline represent an outlier. Win or lose, the Tribe’s lead counsel believes that the paradigm has shifted. Permanently. The most recent ruling in the case, on June 14, reaffirmed that power. As plaintiffs in a claim against the federal agency that issued permits for the pipeline (and the co-defendant/builders of the pipeline), the Standing Rock Sioux Tribe argues that, in addition to violating tribal treaty rights, the colossal conduit threatens the Missouri River, the reservation’s only water supply. The Tribe further contends that National Environmental Policy Act (NEPA) requirements were not met by the Army Corps of Engineers prior to its decision to grant pipeline construction permits. The essence of the case for the defense is the Corps’ claim that its analyses of the pipeline’s cumulative impacts fully complied with statutory law, and that “deference” should be given to the agency’s consideration of matters within its technical expertise. The defendants further argue that legal precedent prescribes that the Tribe must identify a failure to perform a specific statutory duty or treaty provision—as opposed to citing a broad and opaque treaty obligation—to claim for breach of treaty rights. But the story of the uprising at Standing Rock is one of dispossession. 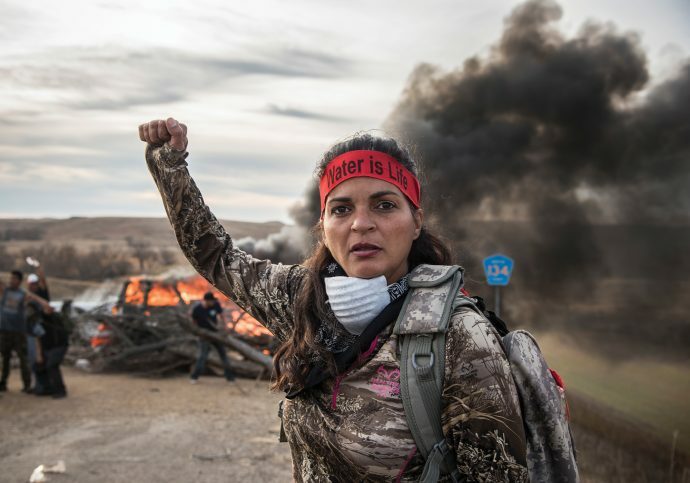 A sense of injustice, above all else, is the reason Native Americans, activists of every stripe, and all manner of everyday folk migrated to an unforgiving patch of former Sioux territory 300 miles west of Fargo to spend ten months squatting in the path of “the black snake,” otherwise known as the Dakota Access Pipeline project. It’s also why Hasselman has put his personal life almost entirely on hold for fourteen months in order that the Tribe can be heard and their story told. A staff attorney with Earthjustice since 2005, Hasselman has successfully litigated multiple regional and national environmental cases. 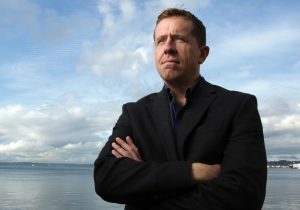 He was featured in the Spring/Summer 2009 issue of BC Law Magazine for his use of the federal Clean Water Act to protect Puget Sound and beat back a developer-friendly, state land-use permit that would have proliferated damaging storm water runoff. Earthjustice, founded in 1971 as the Sierra Club Legal Defense Fund before rebranding in 1997, has represented more than a thousand public interest organizations and individuals. The nonprofit, which provides clients counsel free of charge, is pursing more than 350 active legal cases and owns a reputation as the mastermind of most of the major legal victories for the environment over the past four decades. Standing Rock is not Hasselman’s first exposure to indigenous peoples in the context of the environment. 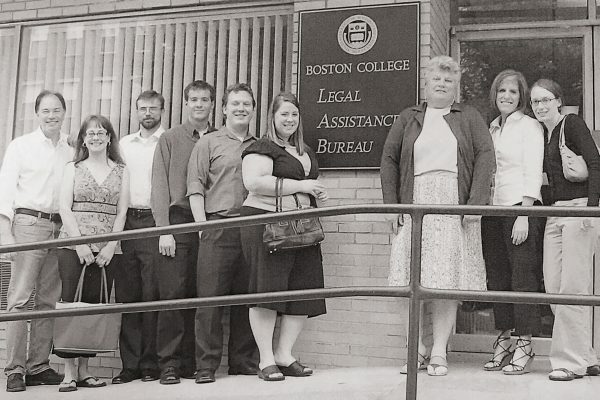 His second-year clerkship at BC Law was a summer honors program at the US Department of Justice, where he researched land and water rights claims on behalf of Indian tribes. Now, as lead counsel in the Standing Rock case, he’s at the forefront of one of the most high-profile actions Earthjustice has undertaken. Standing Rock Tribe reservation encompasses 3,500 square miles of North and South Dakota and is home to 8,250 residents. Its population is 85 percent minority, it is one of the poorest communities in America, and it displays all the accompanying socioeconomic markers. 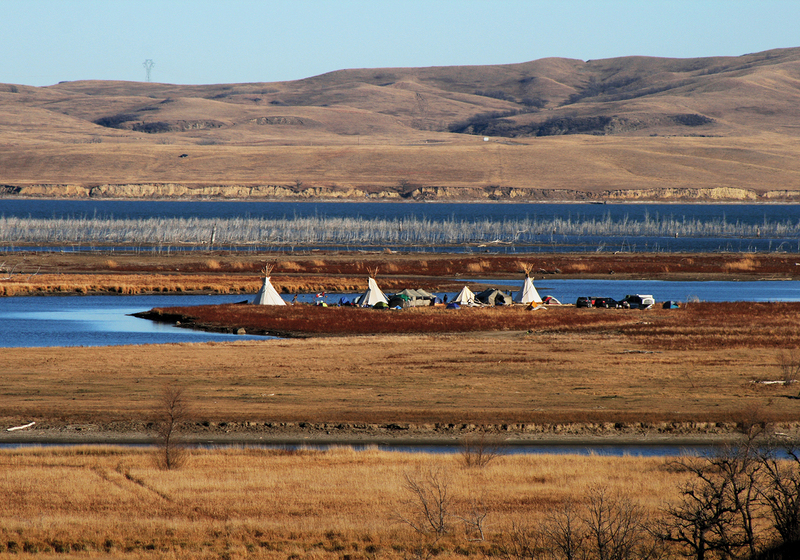 The Tribe holds paramount water rights to the Missouri River and relies on Lake Oahe [Oh-WAH-hee], which sits along the reservation’s eastern boundary, for safe water. Energy Transfer Partners LP is the progenitor of the $3.8 billion pipeline project and the Dakota Access consortium built it. DAPL traverses communities, farmland, tribal territory, and wildlife habitat while carrying more than half the oil production of the entire state of North Dakota across 1,172 miles of environmentally sensitive landscapes. Hasselman immediately cautioned his new clients about the sobering road ahead. “My thought was we would file this lawsuit in Bismarck and we’d get thirty or forty folks from the reservation to show up at the court hearing and maybe get on the six o’clock news,” he said. Six months later, Standing Rock was a national obsession. 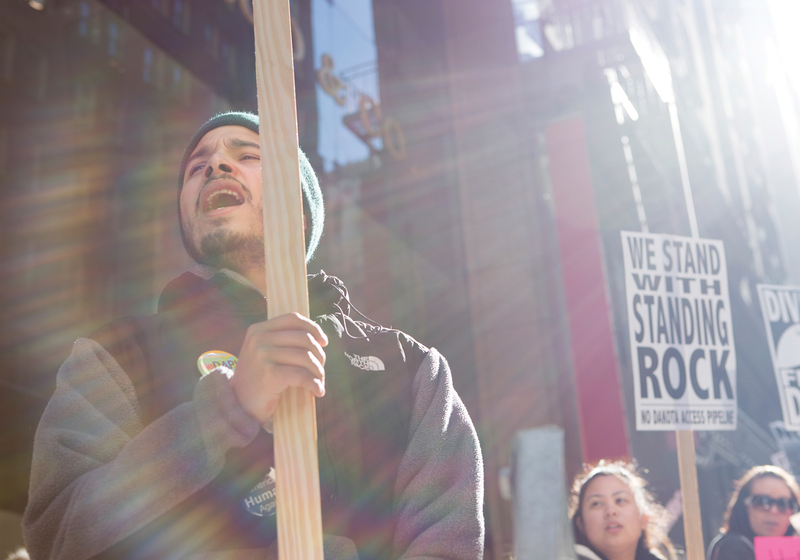 The dispute over its construction had already engendered a large protest movement by the summer of 2016, but the discord shifted into overdrive last Labor Day Weekend. That’s when Dakota Access private security guards unleashed dogs and pepper spray on Native American demonstrators right after workmen bulldozed sacred sites awaiting review by the state historic preservation office—all while a court ruling on the Tribe’s motion for an injunction was still pending. The battle had been brewing long before that holiday weekend. 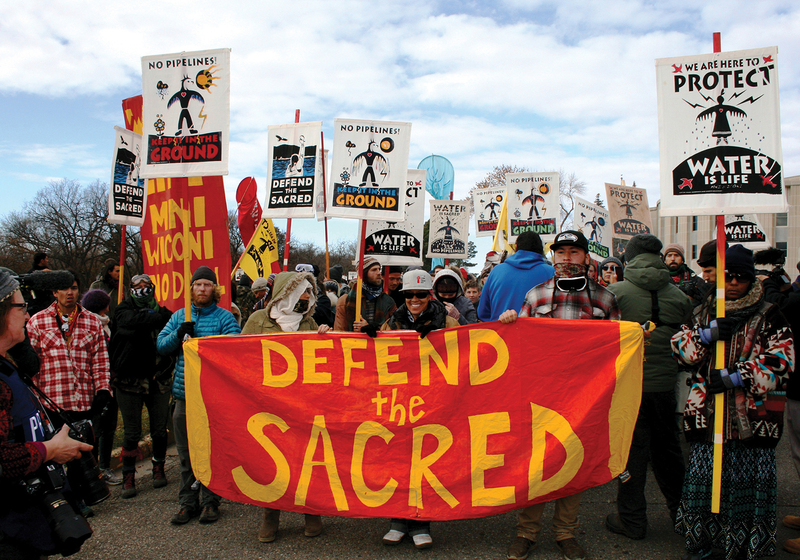 The Standing Rock Sioux Tribe first relayed its concerns about the pipeline’s proposed route to the Corps back in 2014, even before the company applied for permits. Despite the Tribe’s reaffirmation of its objections to the route throughout the permitting process, the Corps released a draft environmental assessment (EA) of the plan in 2015. That document was prepared by Dakota Access. The draft EA did not address DAPL’s potential impact on tribal treaty rights or the reservation’s water supply, nor did it assess the risk of oil spills. The accompanying map didn’t even identify the Tribe’s reservation land. The Tribe submitted multiple technical and legal comments about the environmental assessment, but Dakota Access, which rarely initiated engagement with the Tribe and often ignored tribal outreach, pushed ahead and began building the pipeline in areas beyond the Corps’ jurisdiction in May 2016. By way of a cold call, as luck would have it, the Sioux had already hired Earthjustice a month earlier. The Tribe had read about Hasselman’s work for a group of Coast Salish Tribes in Washington State in a separate proceeding about another pipeline. Hasselman immediately cautioned his new clients about the sobering road ahead. Six months later, Standing Rock was a national obsession. No all-encompassing federal permit is required to build a major crude oil pipeline in the US. Consequently, as Hasselman puts it, “there’s no overarching environmental analysis and no public accountability or transparent conversation about the risks or consequences of these enormous pieces of infrastructure.” There is, however, one (largely insubstantial) catch. Any time a private activity touches water, whether a wetland, stream, or large river, a permit must be secured from the Army Corps of Engineers under the Clean Water Act. The Corps typically streamlines the acquisition of such permits via the Nationwide Permit System, which essentially allows the government to grant pre-authorization for construction. That was how Dakota Access got its permits in July 2016 after the Corps accepted the EA’s conclusions and issued a Finding Of No Significant Impact regarding the pipeline’s construction. In September, the court declined to issue a preliminary injunction on behalf of the Tribe, ruling that the Sioux hadn’t demonstrated imminent harm. Hasselman had been prescient. But within twenty minutes of the ruling, something remarkable happened. The Pentagon’s Assistant Secretary of Defense for Civil Works announced the Corps would take a closer look at the portion of the pipeline that would tunnel ninety-two feet beneath federal soil at the bottom of Lake Oahe. For the Tribe, it was a victory. As BC Law’s Plater explains it, this was a clear case of political will driving agency behavior. The Obama administration wasn’t pleased with the Corps’ standard of review. And now, the reverse is true following the 2016 presidential election. Lake Oahe, actually a dammed reservoir owned by the Corps, was the justification for the deeper dive. Why? Because the lake touches federal land on either side of the Missouri River. 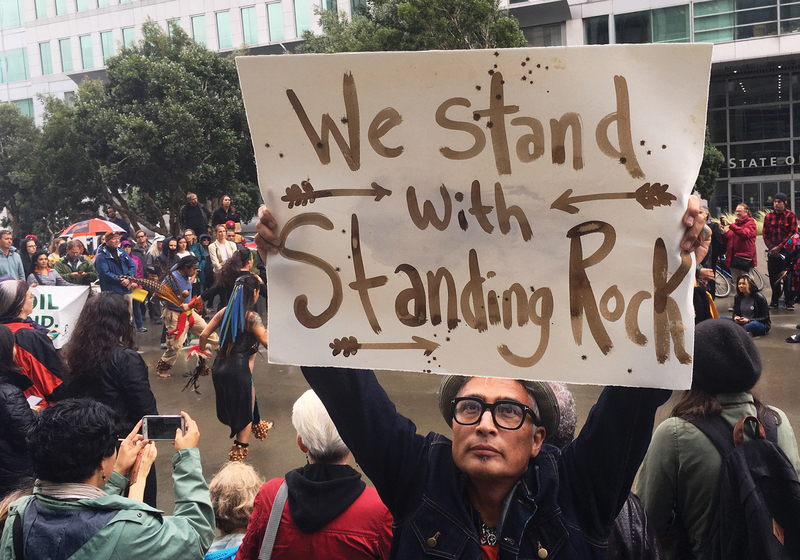 That meant the final permit Dakota Access needed was an “easement,” which falls under the jurisdiction of the Mineral Leasing Act rather than the Clean Water Act. This leasing act right-of-way permit tends to carry a level of scrutiny over and above the rubber-stamped, pre-authorized permits. The Corps has some discretion, but it must deny such permits if certain statutory criteria aren’t met. After the Pentagon’s announcement, Earthjustice went to work behind the scenes, soliciting the government to carefully consider the impact of the pipeline. Dakota Access promptly sued the government for failing to issue the easement. Yet the Corps hadn’t even shared the final EA’s spill model and response plan with the Tribe or the public at this point (those were only recently made available to the plaintiffs under a confidentiality agreement). The Tribe finally had the white knight it had longed for: NEPA. NEPA’s implementing regulations required that the Corps complete an “environmental impact statement,” or EIS, rather than rely on a less probing environmental assessment, which was produced by Dakota Access and never independently reviewed. Translation: There was suddenly a chance that with basically only one-mile of the pipeline still to be constructed, DAPL’s crossing point would have to be moved. None other than the United States District Court for the District of Columbia, where the case is being heard, has, in the past, found environmental assessments legally insufficient for agency actions like permitting riverboat casinos, managing swan populations, and authorizing the use of jet skis. Two days before President Obama left office, the Corps published a public notice in the Federal Register announcing it had begun gathering the information necessary to generate the environmental impact statement. The notice asked that all written comments on the scope of the EIS be submitted by February 20, and revealed that all related public meetings would be announced at least fifteen days in advance in the Bismarck Tribune. Three days later and forty-eight hours into Donald Trump’s presidency, the Army received a Presidential Memo directing the Corps to “review and approve” pipeline permits on an expedited basis. 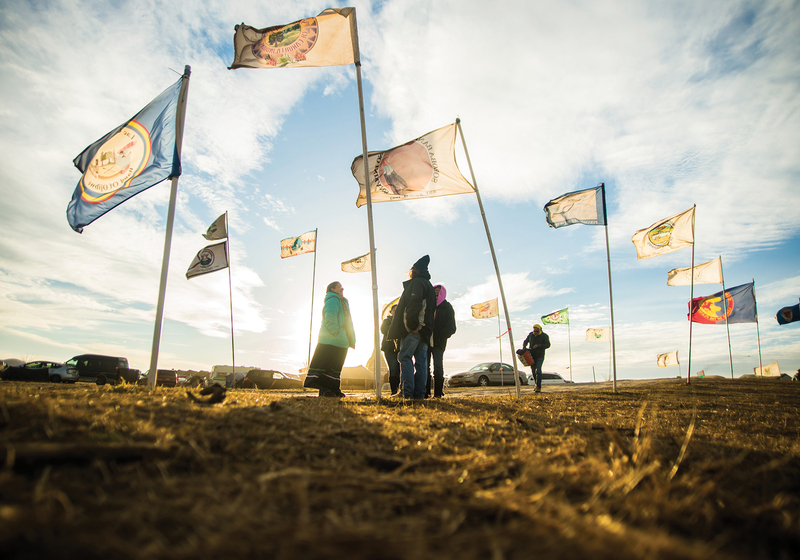 On February 8, the Corps summarily terminated the EIS process and issued the easement to Dakota Access. DAPL began pumping oil in May. The legal fight continues, nonetheless, and more to the point, the movement has retained some momentum. 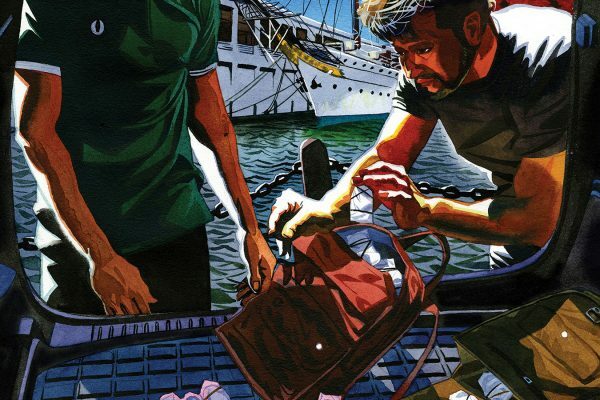 In April, BNP Paribas sold its shares in the loan it had granted for the pipeline. Norway’s DNB and Holland’s ING Group had already divested. “This is a major victory for the Tribe and a vindication of its consistent position from the beginning—the government can’t authorize a project like this without a hard look at the risks and the impacts,” says Hasselman. Judge Boasberg did not rule on whether the pipeline will be shut off in the interim, instead requesting additional briefing on the subject and a status conference that was held on June 21. Still, the battle lines drawn before Judge Boasberg’s ruling illuminate the complexities of each side’s arguments. In court documents, the defendants argue the Tribe’s challenges are without merit and should be denied. The essence of their case is that the EA gave “robust consideration” to the cumulative impacts of the pipeline crossing and that those analyses support the Corps’ conclusions. Earthjustice vigorously attacks the defendants’ counterclaims and presents several arguments in seeking the vacatur. The Corps’ U-turn regarding the environmental impact statement presented an opening for the Tribe. It turns out the Administrative Procedures Act (APA) is an impediment to the Corps’ change of direction since the law requires agencies to supply a reasonable rationale for altering their procedural course. Within the last decade, in fact, the US Supreme Court ruled that when an agency reverses its own prior decision, “the agency must show that there are good reasons for the new policy” [FCC v. Fox Television Stations, Inc., 556 U.S. 502 (2009)]. “Under the APA, a reviewing court has to set aside agency actions that it determines are arbitrary, capricious, or an abuse of discretion,” explains Hasselman. In other words, the agenda of the US Army Corps of Engineers is supposed to be apolitical. The Corps insists there was no change of course, and explains that upon further review, it simply concluded that the environmental assessment, on its own, contained sufficient analyses to support issuing the easement. The Tribe challenges the logic of this narrative, pointing out that pipeline infrastructure upstream of the reservation sits on land that the EA itself rates as “highly susceptible” to landslides, yet the document also calculates the risk of an oil spill at Standing Rock to be “very low.” The issue the Tribe raises isn’t monumentally out of line considering that Sonoco Logistics, the company operating the pipeline, owns the worst record for spills in the nation with over 200 documented incidents since 2010. In court documents, the defense doubles down on the issuance of the easement and the decision to abandon further investigation of environmental impacts. The Corps claims it acted with the understanding that Dakota Access would meet thirty-six additional “conditions” placed upon the easement, which further satisfied the agency’s legal obligations and rendered supplementary NEPA analysis redundant. Earthjustice counters that imposing new “conditions” doesn’t correct an EA that wasn’t valid in the first place, and adds that most of the requirements the Corps tacked on were already terms Dakota Access had to meet according to the initial permits issued in 2016. Early on in the permit application process, an alternative route proposed for DAPL would have crossed just north of Bismarck, which Hasselman points out is a prosperous capital city that is 92 percent white, a fact that he sees as relevant to the case. The Corps considered the oil spill impacts ten miles downstream in reviewing the Bismarck crossing before Dakota Access settled on Standing Rock, where the half-mile buffer between the pipeline crossing and the reservation meets regulatory standards, according to the Corps. Hasselman calls this incongruity a “galling” double standard, but believes the evidence most harmful to the defense has do with gerrymandering. In the course of analyzing the population demographics pertaining to the pipeline’s environmental justice implications, the Dakota Access EA defined the area affected by the DAPL by using census data not from the Lake Oahe pipeline crossing, but rather from the location of the nearby drilling boreholes. Those census tracts are 1) outside the reservation boundaries; 2) boast a population that is 98 percent white; and 3) sit mostly upstream of the pipeline crossing. This is the Tribe’s second core argument. By swallowing what the Tribe claims is the EA’s inadequate and misguided environmental justice investigation, and by dismissing possible associated impacts, the Corps failed to produce a lawful analysis to guide and inform its permit decisions. The United States Government is the acting trustee for the land and water rights of American Indians. The Supreme Court has affirmed that the US has “charged itself with moral obligations of the highest responsibility” in executing its duties as trustee. The Tribe says the Corps violated that trust by issuing the easement. Burrowing into the textual history of treaties, the defense counters that treaty rights are not abstract and argues that an EA is not rendered unlawful simply because an agency could have considered more impacts. Of course, even in light of the latest finding by the US District Court, it’s hard to know how the case will shake out. The June 14 decision may have established some key precedents regarding environmental justice and treaty rights, but it is unclear if the order requiring the Corps to perform further study will bring about a victory for the Tribe, or, for that matter, stop the pipeline’s oil flow for even one day. New arguments on the DAPL’s continued operation were in progress at press time. For his part, Hasselman is more focused on the battle’s broader implications. “Hey, we won before we lost [when the Corps agreed to an EIS prior to the change in administrations]. I think we could be vindicated on our legal issues, or not. Then the pipeline will suffer whatever consequences there are. It might come short of having to move,” he says.